When I started getting “on the net”, your browser choices for a “PC” (as opposed to Mac) browser were limited. These days there are lots of options as to how you browse the WWW. Now with mobile devices, netbooks, tablets, Android devices, iPhones & iPads, Windows 7, “the Cloud” etc etc, we are bombarded with how we can experience the digital world. We also have lots of digital outlets for speaking our mind and staying in touch with our friends. MySpace, Facebook, Twitter, Blogs with RSS feeds and YouTube. Tabbed browsing was the first breakthrough for keeping our influx of information coming without having to re-open our favourite sites. But somewhere along the line, even that became cumbersome. This is where the social browser comes in. At a glance, I can see which of my Facebook friends are online, how many tweets and facebook statuses have not yet been ‘read’, if there are any YouTube subscriptions that have released new videos, if my Gmail account has any unread mail, and put up an RSS feed on any website or blog that has the RSS feature available. 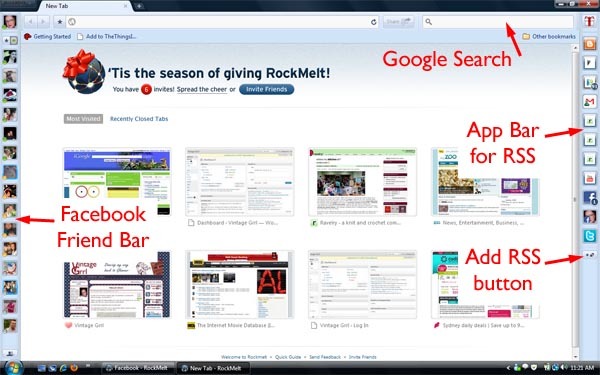 For the last 2 weeks I have been using RockMelt exclusively as my browser. It’s not the first social browser, but it is the latest one released. It’s built on a “Chromium” base (like Google’s Chrome browser) and is quite easy to use. Easy to use, pretty intuitive. Can search Google.com from the address bar. Can share website finds through Twitter or Facebook with the click of one button. All my social media is easy to see in a sidebar, and can be checked with a single click. All in all it has been a comfortable change from Firefox to RockMelt. Do I prefer it? I think with a few more features, it could definitely be my browser of choice. I have 6 RockMelt invitations to share if you’d like to try it for yourself. Just leave a comment below saying you’d like one (make sure your email address is there somewhere) and I’ll send it on over. Next I’ll be looking at using Flock.